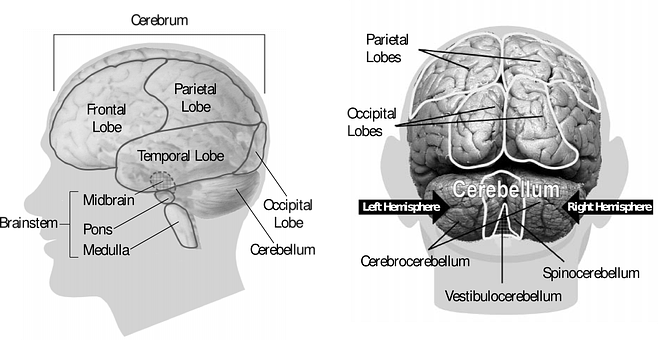 The parietal lobes of the brain lie just behind the frontal lobes and in front of the occipital lobes (the vision centers of the brain). The parietal lobes can frequently be injured in head trauma and the function of the parietal lobes has been extensively studied. A recent previous blog has discussed frontal lobe injuries in concussion and traumatic brain injury (TBI). An anatomical analysis is one useful context to understand the brain, vision, and head injuries. Trauma is often directed at one specific anatomic location in the brain. The parietal lobes are involved with integration of sensory information, and one important sense is eyesight. Human beings have an automatic three-dimensional view of the universe- we seem to know where objects are in space (a chair across the room). Commonly, the public is told that depth perception is derived from having two eyes. Predators like human beings have evolved two eyes close together (unlike rabbits) to judge distance and seize prey. But this only a part of the picture. Even if a person covers one eye, that individual is still keenly aware of the position of objects in a room, and that trees at a distance are still far away. Human beings are very alert to where their feet and hands are in space. These concepts seem so simple and intuitive that seeing the world is part of being aware. But this universe is far from simple- the brain must use clues from the occipital lobe sent to the parietal lobe in order to form a complete three-dimensional image. Damage to the parietal lobe can cause confusion in judging depth and such injured patients often bump into walls or other objects when walking. Individuals often become confused in judging the direction left vs right, and this can lead to a confusing world and difficulty in navigation. The eyes must track to be effective- the eyes must follow a moving object. The parietal lobe can cause tracking difficulties and injury can cause a patient to simply ignore part of the surrounding world. The parietal lobe has other critical functions in speech and language which reach beyond the scope of visual function. Deficits in speech and language can obviously be associated with severe functional impairment and are often seen in parietal lobe strokes. However, in mild TBI patients, the deficits can be more subtle but still quite frustrating. Neurologists and neuro-psychologists can do more detailed testing to examine parietal lobe function. The ophthalmologist cannot be satisfied with measuring 20/20 vision and assume the visual system is intact. As noted, patients with parietal lobe injury can have difficulty tracking moving objects and tracking can probably best be tested by an experienced ophthalmologist. Also, parietal lobe damage can effect peripheral vision and the ophthalmologist has sophisticated visual field measurement equipment in the office. All of my head injury patients get detailed computerized visual field measurements. As discussed in prior blogs, visual fields are frequently abnormal in TBI victims. Importantly, patients with more vague visual complaints often have difficulty describing parietal lobe visual dysfunction. It is much easier to describe loss of vision in one eye or double vision. Thus, the listener (the doctor) must probe for the more subtle symptoms of vision problems. These subtle visual problems can have a huge impact on normal daily function. One can easily imagine the complex series of visual tasks that are necessary to drive a car. The parietal lobe is obviously involved.